2Pharmaceutical Microbiology Division, National Institute for Pharmaceutical Research and Development, Idu  Abuja, Nigeria. Methanolic extracts of leaves of Eucalyptus camaldulensis and Terminalia catappa were studied for in vitro microbial activities by agar dilution method. The phytochemical analysis of the crude extracts of the medicinal plants revealed the presence of saponin, saponin glycosides, steroid, cardiac glycoside, tannins, volatile oils, phenols and balsam (gum). The methanolic extracts of the two plants inhibited the growth of Bacillus subtilis and Staphylococcus aureus (ATCC 103207 and Clinical strain respectively) but had no inhibitory effects on Pseudomonas aeruginosa, Salmonella typhi and Escherichia coli. Candida albicans was inhibited by the crude extracts of E. camaldulensis only. Accelerated gradient chromatography (AGC) gave fractions of the extract of T. catappa that were more active on Candida albicans and Escherichia coli than the crude extract. The minimum inhibitory concentration (MIC) of the extracts ranged from 1.25mg/ml to 5mg/ml. The results obtained suggest that T. catappa and E. camaldulensis can be used in treating diseases caused by the test organisms. Nature has been a source of medicinal agents for thousands of years and since the beginning of man. In Nigeria, almost all plants are medicinal and the application of medicinal plants especially in traditional medicine is currently well acknowledged and established as a viable profession (Kafaru, 1994). Extraction of bioactive compounds from medicinal plants permits the demonstration of their physiological activity. It also facilitates pharmacology studies leading to synthesis of a more potent drug with reduced toxicity (Ebana et al., 1991; Williams, 1996; Pamplona  Roger, 1999; Manna and Abalaka, 2000). Furthermore, the active components of herbal remedies have the advantage of being combined with many other substances that appear to be inactive. However, these complementary components give the plant as a whole a safety and efficiency much superior to that of its isolated and pure active components (Shariff, 2001). Presently in the developing countries, synthetic drugs are not only expensive and inadequate for the treatment of diseases but are also often with adulterations and side effects (Shariff, 2001). There is therefore the need to search for plants of medicinal value. The plants used in the present study are Eucalyptus camaldulensis (Myrtaceae) and Terminalia catappa (Combretaceae), which are used traditionally for the treatment of wounds, boils and other ailments with which the test organisms are routinely associated. The main objective of this study is to examine the antimicrobial activities of the methanolic extracts of E. camaldulensis and T. Catappa. The antimicrobial activities of the active fractions of the extracts were also determined. Eucalyptus camaldulensis and Terminalia catappa were collected at the Nursery Section of Niger River Basin Development Authority, Minna, Nigeria. The plants were duly authenticated at the Herbarium Department of National Institute for Pharmaceutical Research and Development (NIPRD), Idu-Abuja, Nigeria. The organisms used were Bacillus subtilis, Escherichia coli (ATCC 10412), Pseudomonas aeruginosa (ATCC 27 853), Staphylococcus aureus (ATCC 103207), Staphylococcus aureus (clinical), Candida albicans (clinical) and Salmonella typhi (clinical). The organisms were obtained from the Pharmaceutical Microbiology Unit of NIPRD, Idu  Abuja, Nigeria. Exactly 0.2ml of overnight cultures of each organism was dispensed into 20ml of sterile nutrient broth and incubated for 3  5h to standardize the culture to 106 cfu/ml. A loopful of the standard cultures was used for the antimicrobial assay (Collins et al., 1995). The old leaves were picked from stem and air dried over a period of two weeks. 50.0g each of the dried leaves were used for the extraction. The method of Okogun (2000) was used to obtain the plant extract. Fifty grammes (50g) of dried plant material were extracted with 200ml of solvent (in the ratio of 9:1ml distilled methanol: water respectively). The leaves were completely submerged and then covered with aluminium foil. Extraction was allowed to proceed for 48h. The extract was decanted and the solvent removed by evaporation at room temperature (28 + 2oC) to obtain the extract. The air dried extract was stored for 48h in sterile universal bottles at room temperature. The sterility of the extract was tested before use. The phytochemical components of the medicinal plants were screened for using the methods of Harbone (1984) and Trease and Evans (1989). The components analysed for are saponins, saponin glycosides, steroid, glycosides, anthraquinones, tannins, flavonoids alkaloid, volatile oils, phenols and balsam (gum). The method of Collins et al. (1995) was used to test for antimicrobial activity of the plant extracts. 0.2g of the extract was reconstituted in 5ml sterile distilled water and vortexed for homogeneity. 1ml of the reconstituted extract was added to Petri dishes having sterile molten nutrient agar (Oxoid) to make a final concentration of 2000mg/ml. The plates were prepared in duplicates and allowed to set at room temperature. A loopful each of the standardized culture of test organisms was streaked on the solidified medium and incubated for 24h at 37oC. Control plates comprising extract without inoculum and inoculum with extract were made in parallel. The MIC of the plant extracts was determined on solid medium (Nutrient agar) using the method of Collins et al. (1995). The range of concentration used was 0.0625  5.0mg/ml. Three grammes (3.0g) of leaf extract of the plants were dissolved in small quantity of distilled methanol. 5g of silica gel was added to the mixture and stirred thoroughly after which it was transferred to a mortar and mixed thoroughly with pestle. The components of the mixture were then separated using AGC machine (FMI LAB Pump Model QD. ALITEA. AB. Stockholm, Sweden). The fractions were collected in sterile test tubes for further analysis. TLC plates were prepared and spotted with fractions of the medicinal plants separated by the AGC. The spotted plates were then placed in TLC tank containing the solvent system: Butanol: Acetic acid: water in the ratio 60: 15: 25 respectively for E. camaldulensis fractions while the solvent system: Hexane: Ethylacetate: Methanol in the ratio of 40: 40: 20 respectively was used for T. catappa. The separated components on the TLC plates were viewed using ultraviolet light (Eagle Scientific Ltd., Great Britain) at 365nm wavelength. Fractions from the AGC with similar components on TLC were combined and used for antimicrobial assay. The combined fractions of E. camaldulensis were tested for activity on the test organisms using the method of Collins et al. (1995) as described in screening for antibacterial. The combined fractions of T. catappa were similarly tested. Phytochemical screening of crude extracts of E. camaldulensis and T. catappa indicated that both plants had saponins and tannins. T. catappa had saponin glycoside, steroid, digitalis glycosides (cardiac) and phenols which were absent in E. camaldulensis. However E. camaldulensis had volatile oils. The components, anthraquinones, hydrolysable tannin, flavonoid, alkaloid and glycosides were not detected in the crude extracts of the two plants tested (Table 1). The results (Table 2) revealed that the crude extracts of the two plants exhibited antimicrobial effects on some test organisms. Both plant extracts inhibited the growth of B. subtilis, S. aureus (ATCC 103207 and clinical) but were unable to inhibit the growth of Pseudomonas aeruginosa, Salmonella typhi and Escherichia coli while only the extract of E. camaldulensis inhibited however the growth of C. albicans (Table 2). The MIC of E. camaldulensis extract for S. aureus (clinical and typed) and B. subtilis was 5 mg/ml whereas it was less than 0.0625 mg/ml for C. albicans (Table 3). The MIC was 1.25 mg/ml for S. aureus (clinical and typed) and 5 mg/ml for B. subtilis when the extract of T. catappa was tested. P. aeruginosa, E. coli and S. typhi exhibited resistance to all the concentrations of both plant extracts used in this study. Table 4 shows the results of the antimicrobial activity of combined fractions of E. camaldulensis. Combination of the fractions was based on similarity in Rf values.The results revealed that fractions 1  4 and 5  7 were unable to inhibit the growth of any of the test organisms. Fractions 8, 11  14 and 15 inhibited the growth of C. albicans, Staphylococcus strains and B. subtilis. Fractions 16  18 and 19  21 had a similar result except that the growth of C. albicans was not inhibited. None of these fraction combinations inhibited the growth of P. aeruginosa and E. coli. For T. catappa, fractions 9  10 inhibited the growth of the two Staphylococcus strains tested while fractions 16  19 inhibited the growth of C. albicans, E. coli, B. subtilis and the two Staphylococcus strains. The rest of the fractions exhibited no antimicrobial activity on the test organisms (Table 5). The results (Table 6) of the phytochemical screening of active fractions in extracts of E. camaldulensis revealed the presence of alkaloids, volatile oils and balsam (gum). Tannins were detected in active fractions of T. catappa extracts. However, only T. catappa had glycosides. Saponins, flavonoids, steroids were not detected in the active fractions of both plants tested (Table 6). The crude extracts of medicinal plants studied were found to contain one or more of the following phytochemical compounds saponins, saponin glycosides, steroid, cardiac glycosides, tannins, volatile oils, phenols and balsam (gum). Other investigators (Ahmad et al., 1998; Pamplona  Roger, 1999; Shariff, 2001) have reported the presence of these components in members of the families, Combretaceae and Myrtaceae, to which the plants used in the present study belong. The inhibitory effects of these medicinal plants on the microorganisms may therefore, be due to the presence of the above phytochemical components. The results of the present study showed that the crude extracts of T. catappa and E. camaldulensis did not inhibit the growth of Pseudomonas aeruginosa, Salmonella typhi and Escherichia coli. This means that the extract have no effect on these organisms. The minimum inhibitory concentration (MIC) for Bacillus subtilis is higher than that of Staphylococcus aureus for the plant, T. catappa,meaning that higher doses of antimicrobial agents will be required in infections where B. subtilis is the aetiologic agent. The MIC value for Candida albicans was less than 0.0625 :g/ml suggesting that very small amount of the drug is required to inhibit the growth of the organism thus E. camaldulensis is very potent against C. albicans. Some fractions of T. catappa showed inhibitory activity on C. albicans and E. coli, which were resistant to its crude extract. This could be due to the fact that the amount of the components in crude extract may be small or diluted and when fractionated, the components become concentrated and therefore exhibit activity on the organisms that were initially resistant to the crude extract. The results of the present study also showed the presence of alkaloids and glycosides in fractions of E. camaldulensis and T. catappa respectively. Saponins, steroids, saponin glycosides and phenols were absent from the fractions of T. catappa, although they were originally present in the crude extract. The loss of these phytochemical components may be due to fractionation. Harbone (1984) reported that the activity of plant extracts can sometimes change after fractionation and a pure crystalline compound may eventually be obtained which lacks the activity of the original extract. The occurrence of tannins in E. camaldulensis and T. catappa show that the plants may be useful in various industries. For example, tannin is useful in food, pharmaceutical and leather industries as well as in agriculture (Nguji, 1988; Dalziel, 1995). The lemon scented volatile oil in E. camaldulensis may be incorporated in pharmaceuticals e.g. Eucalyptus syrup, anticough solutions and suppositories for its strong antibacterial action. It could also find much use as expectorants and decongestants. Terminalia catappa and E. camaldulensis have been found to be effective against some pathogenic microorganisms involved in wounds, burns and skin infections. Thus, the two plants can be used in the treatment of these ailments. The extracts of the plants proved active against Staphylococcus aureus and Bacillus subtilis at low concentration. They are however not effective against Pseudomonas aeruginosa, Escherichia coli and Salmonella typhi. The authors wish to express their profound gratitude to Dr. (Mrs.) F. O. Kunle, Mr. J. Apev, Mr. A. Ogbaji and the entire staff of Pharmaceutical Microbiology Division, National Institute for Pharmaceutical Research and Development (NIPRD), Idu-Abuja, Nigeria for their valuable contributions to the success of this research. Ahmad, I., Mehomood, Z. and Mohammed, F. (1998) Screening of some Indian medicinal plants for their antimicrobial properties. Journal of Ethnopharmacology 62(2), 183  193. Collins, C. H., Lynes, P. M. and Grange, J. M. (1995) Microbiological Methods. (7thEdn.) Butterwort-Heinemann Ltd., Britain, pp.175-190. Dalziel, J. M. (1995) The Useful Plants of West Tropical Africa. Longman Group Limited, Philippines, pp. 156  160. Ebana, R. U. B., Madunagu, B. E., Ekpe, E. D. and Otung, I. N. (1991) Microbiological exploitation of cardiac glycoside and alkaloids from Garcinia kola, Borreria ocymoides, Kola nitida and Citrus aurantifolia. Journal of Applied Biotechnology 71: 398  401. Harbone, J. B. (1984) Phytochemical Methods: A Guide to Modern Technique of Plant Analysis. (2nd edn). Chapman and Hall, London, pp. 1, 19, 37  168. Kafaru, E. (1994) Immense Help From Natures Workshop. Elika Health Services Ltd, Academic Press Plc. Lagos, Nigeria. pp. 1  27. Manna, A. and Abalaka, M. E. (2000) Preliminary screening of the various extracts of Physalis angulala (L.) for antimicrobial activies. Spectrum Journal 7(2): 119  125. Nguji, A. A. (1988) Tannins of some Nigerian flora. Nigerian Journal of Biotechnology 6: 221  226. Okogun, J. I. (2000) Methods of Medicinal Plant Extract Preparation. National Institute for Pharmaceutical Research and Development (NIPRD). Idu  Abuja, Nigeria. Pamplona  Roger, G. D., (1999) Encyclopedia of Medicinal Plants. Vol. 1 and 2, (2nd Edn). Education and Health Library, The European Union, U. K. pp. 128  150. Shariff, Z. U. (2001) Modern Herbal Therapy for Common Ailments. Nature Pharmacy Series (Volume 1), Spectrum Books Limited, Ibadan, Nigeria in Association with Safari Books (Export) Limited, United Kingdom, pp. 9  84. Trease, G. E. and Evans, W. C. (1989) Pharmacognosy (13th edn). English Language Book Society, Bailliere Tindall, Britain, pp. 378, 386  480. Williams, V. L. (1996) The Witwater Strand Multitrade. Veld and Flora 82: 12  14. 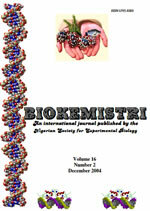 © 2004 Nigerian Society for Experimental Biology.